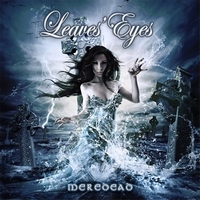 Meredead is the fourth full-length album from Norwegian / German symphonic metal band Leaves' Eyes. Led by the formidable Liv Kristine Espenæs Krull this band has become one of the most recognizable female-fronted symphonic metal bands in the world thanks not only to the image of the singer but also heavily due to the band's heavily Viking-inspired lyrics and inclusion of traditional folk melodies and instruments. Previous Leaves' Eyes records have all been extremely enjoyable melodic metal with generally a few stand-out tracks amongst those on offer. With Meredead Leaves' Eyes has broken this chain and produced an album that is uniformly strong, which is probably a good thing if there's any sort of sibling rivalry between Liv and her sister Carmen, whose band Midnattsol has just released a storming third album! Alexander Krull's vocals on Meredead are less than on previous albums. This could be seen as a mixed blessing as some of my favorite Leaves' Eyes songs, such as The Thorn from the album Vinland Saga, were made by the growls. However, on Meredead the lessening of Krull's vocal input has allowed Liv Kristine to shine more than on any previous album. Liv is seen by many to be one of the best vocalists in this sub-genre. She has a warm voice into which she projects soulful emotions in a way that puts many other singers to shame. 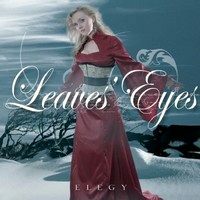 The folk melodies and symphonic elements in Leaves' Eyes' music is matched perfectly with the enchanting voice of the Norwegian lady, whether she is singing in English, Norse or Old English. Choirs, traditional folk instruments and guest singers all add to the allure of the music on this album with performances from Victor Smolski's Lingua Mortis Orchestra, Maite Itoiz and John Kelly (of the traditional music ensemble Elfenthal), Anette Guldbrandsen (who also featured on Leaves' Eyes' Northbound EP), and of course Liv's little sister Carmen Elise Espenæs. There is also a phenomenal cover of Mike Oldfield's To France. When I put this album on for the first time I was expecting a decent album. This exceeded all my expectations in every possible way. Every song is just fantastic yet even with such a high standard there are some stand-put tracks - Sigrlinn, Nystev and the cover of To France being amongst the pick of Leaves' Eyes entire discography. Leaves' Eyes fans should all embrace this album completely while past detractors should give this one a chance. This is going to be one of the albums of the year. I really cannot think of a bad word to say about it and have no hesitation in recommending it extremely highly! 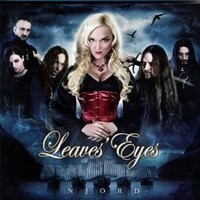 Njord is the latest piece of work of Leaves' Eyes, a kind of concept album about Njord, the nordic God of wind and sea. Actually it's the kind of album you expect from Leaves' Eyes and it has some really good tracks incl. the title track Njord and Northbound, the dark Ragnarök or the single My Destiny which are the highlights. The other songs aren't bad, but well they aren't at the same level. The album is very symphonic and bombastic, perhaps a bit too bombastic... For the first time they worked with an orchestra which Rage guitar virtuoso Victor Smolski is responsible for. In my opinion Liv Kristin is trying too much to sing like Tarja Turunen and so at some parts she seems to force it too much... Don't get me wrong, I'm a huge fan of Liv Kristin and for me she is one of the best female singers in the biz, but I prefer it when she isn't doing the high notes - at least not that much. Njord is fun and a must-buy for all Leaves' Eyes fans as well as interesting for all fans of gothic and symphonic metal. Elegy is the first single of Vinland Saga - the coming album of Leaves' Eyes. The track Elegy is presented on this single in 2 versions, but even more interesting are the three non-album tracks and the demo version of Solemn Sea. My first impression is that Leaves' Eyes are more commercial, but that can be a wrong conclusion, coz a single should draw attention to an album. And this song will get them more attention. A catchy bittersweet tune. It seems that they perfectionized the Leaves' Eyes sound. Still forceful guitar riffs build a counterpart to the God-like vocals of Liv Kristin. Starting with some keyboard sounds which usually can be found in electro-gothic rock. But only as a kind of intro, even if you can hear it in the background, but it's almost melting into the soundscapes they create. A demo version of Solemn Sea gives you an idea about what to come. A heavy, grooving song with an unusal drum beat, Liv's soprano - here a bit higher and partly opera-like - and Alex' growls. Can't wait to hear the final version! 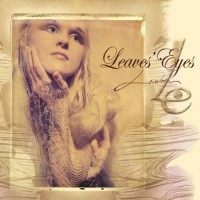 Many metal / gothic metal fans will remember Liv Kristin from her days in Theatre Of Tragedy and some might even know her first solo album Deus Ex Machina, now she's back with her own band - Leaves' Eyes. Actually her backing band is Atrocity which isn't a big surprise, coz Liv is married to Alex Krull, the mainman of Atrocity. Musically Lovelorn is atmospheric, guitar-driven heavy dark metal. The opening track is Norwegian Lovesong and gives a good impression of Lovelorn. Starting slowly, but soon the band joins in full force. Heavy, aggressive guitar riffing is building a nice counterpart to the angel-like vocals of Liv Kristine and the strings. The song ends suddenly. Next in line is the really heavy Tale Of The Sea Maid which let you think of Theatre Of Tragedy, but at least this one has no growls. But at some tracks Alex Krull is adding some growls and so revives the memory of Theatre Of Tragedy - a bit. Ocean's Way is way heavier then the other tracks and here Liv's husband is adding growls. Partly Liv Kristin is singing opera-like, but changes back to her more natural and more emotional way of singing. It they would have chose this one for the single they would probably attract fans of Nightwish and Within Temptation... But it would have give a wrong impression of Lovelorn, too. An enchanting ballad is Lovelorn. Her sweet, beautiful voice is giving you goose-bumps. Very romantic. Or check out For Amelie which is touching your heart. Some phrasing even let me think of Kate Bush... A balladesque tune with heavy parts. One of my favorites. Temptation starts atmospheric and with dark, threatening whispering. Very aggressive and threatening the vocals of Alex Krull and his wife sounds like pleading.... Asking for mercy... Bittersweet and terrorizing. A new version of the beauty and the best. This album make you forget the last Theatre Of Tragedy releases and bands like Within Tempation, After Forever and even Nightwish should be aware of Leaves' Eyes who easily entered the premier league with their first album. Soon Mrs. Espenaes-Krull will fight for the crown.